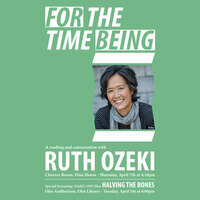 Ruth Ozeki is a novelist, filmmaker and Zen Buddhist priest. Her first two novels, My Year of Meats (1998) and All Over Creation (2003), have been translated into 11 languages and published in 14 countries. Her most recent work, A Tale for the Time-Being (2013), won the LA Times Book Prize, was shortlisted for the Man Booker Prize and the National Book Critic’s Circle Award, and has been published in over thirty countries. Ruth's documentary and dramatic independent films, including Halving the Bones, have been shown on PBS, at the Sundance Film Festival, and at colleges and universities across the country.